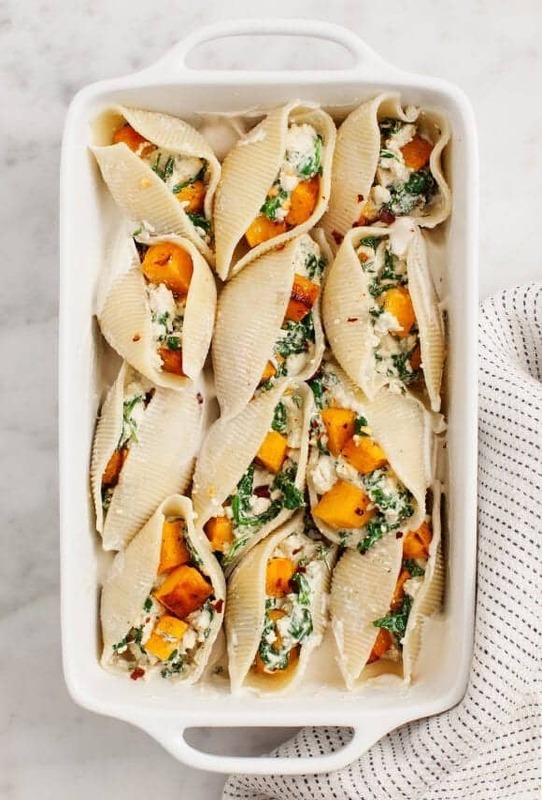 The creamy, lemony "ricotta" filling of these vegan butternut squash stuffed shells makes this recipe an all-time blog favorite! I know – there’s nothing especially Thanksgiving-ey about this recipe. I had a number of vegetarian “main course” ideas that I thought of sharing this year. At the top of the list was a creamy vegan pot pie with a delectable flaky crust… but I didn’t get to it. I’m still excited by that idea and when I do get to it, it’ll be amazing… but the week I was creating this recipe, I had leftover butternut squash, and I was craving pasta. Pot pie had to wait. This recipe is loosely based on the other stuffed shell recipe that I made for this blog a few years ago. It’s been a favorite, mostly because (in my opinion) it hardly tastes vegan. The “ricotta” – made from cashew cream, crumbled tofu, herbs, and lemon zest – is rich and flavorful. If your family is squeamish about tofu, just don’t tell them. They’ll never suspect it here. In the spirit of fall, I stuffed my shells with roasted butternut squash. Fill them, bake, and top with dollops of the extra cashew cream, if you like. This vegan stuffed shell recipe is a great one for entertaining. 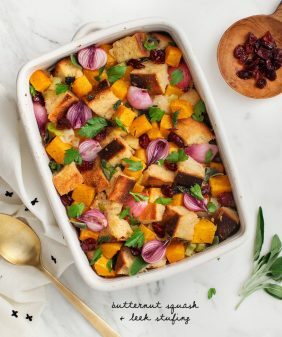 Make it as a vegetarian main at Thanksgiving or serve it for the winter holidays! Preheat the oven to 350°F and line a baking sheet with parchment paper. Toss the butternut squash with a drizzle of olive oil and a few generous pinches of salt and pepper. Roast until golden brown, 20 to 25 minutes. Make the cashew cream: Blend together the drained raw cashews, fresh water, garlic, lemon juice, ½ teaspoon salt and pepper. Make the filling: In a medium skillet, heat a drizzle of olive oil over medium heat. Add the spinach in increments, along with a pinch of salt, and sauté until all the spinach is incorporated and wilted. Remove from heat and let cool slightly. Squeeze out any excess liquid and chop. In a medium bowl, combine the the spinach with the crumbled tofu, oregano, lemon zest, red pepper flakes, at least ¼ teaspoon salt, freshly ground black pepper and 1 cup of cashew cream. Season to taste, adding more salt and pepper as desired. Bring a large pot of salted water to a boil. Add the shells and cook according to the package directions until al dente. Drain. Assemble the shells. Spread ¼ cup of the reserved cashew cream on the bottom of an 11x7-inch baking dish. Fill each shell with some of the filling and a few cubes of butternut squash, and place into the baking dish. Drizzle a little olive oil over the shells and bake, covered, for 15 minutes, or until heated through. Remove from the oven and serve with the remaining cashew cream. *Depending on your blender, you may want to soak the cashews in water for a few hours (or overnight) in order for them to become creamy when pureed. Drain and rinse when ready to use. If using a Vitamix blender or similar, soaking is not necessary. These shells have my mouth watering! So delicious. I love the cashew cream in the filling! I love the filling of these jumbo shells! That cashew cream and butternut squash looks delicious. I’m really on the look out for fillings that don’t involve an insane amount of cheese. I’m happy you shared these! Oh my gosh, these are the most delicious things I’ve seen all day (and I’m been browsing food blogs for hours in class, haha). I love combining tofu and hummus to make a kind of tofu ricotta, and I’m sure that’s what it’s like here with cashew cream! Stuffed into pasta and I’m sold. Count me in! I’ll make this for my husband. I’ll sub full fat ricotta since we aren’t vegan and ricotta is pretty much whey protein in cheese form! 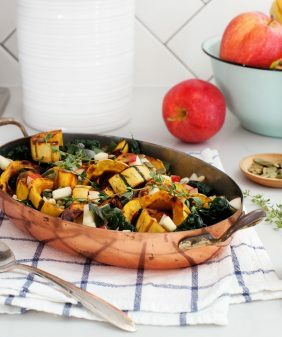 And thanks for continuing to make great plant based recipes…been following your blog for a few months now, and absolutely love what I’ve tried! This post has made me hungry. And I just ate. Yum! I’d probably, oh, quadruple the garlic for our family’s tastes, though. Wow, these shells are so gorgeous and sound like such an amazing dinner. Would never know they’re vegan! God this looks delicious! I can’t wait to finally try cashew cream now that I have a blender! Love that recipe. It looks delicious! What an absolutely delicious looking dish. I’m such a horribly picky eater but when you make food look like this, I wouldn’t even ask what’s in it! Beautiful! the best recipe and thanks! happy holidays from MKE, WI! This looks delicious! Do you think it would freeze well? I’m 6 months pregnant and starting to save recipes to freeze for when baby comes. I’ve never made anything like the cashew cream so I’m not sure how well it would fare in the freezer. Did you try freezing this? I was trying to figure out if it Friday well, too. It’s not often I comment on recipes I use, but this one warrants a comment. These were seriously one of the most delicious dishes I have ever cooked. Thank you for sharing! 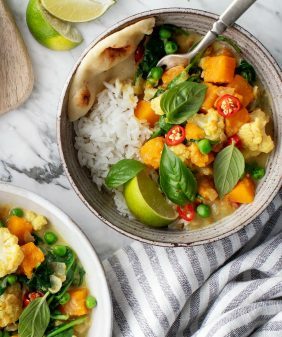 Hey, this looks amazing I want to make it for my flatmates tonight, I could only find firm silken tofu at the shop- is that OK to use? Hmm…I think that’ll make the filling too watery – there’s a big textural difference between regular firm and silken firm tofu (regular firm tofu is the kind that’s sold in the refrigerated section, and it’s more crumbly). It might work ok but I can’t say for sure without trying it. This sounds so amazing! 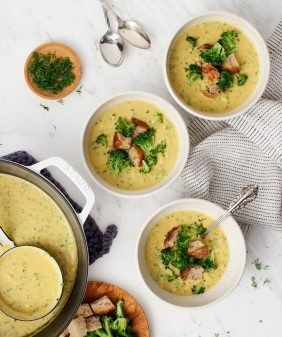 Love dairy-free recipes that still look just as delicious! Yum! Can we use salted cashews rather than raw for this recipe?? Hi Sharon, no, it’s really important to use raw cashews because they have a neutral flavor in the sauce. Otherwise, your cream sauce will end up tasting very much like cashews. I would also love to know where to get gluten free shells!! I was just thinking about what i could use instead but would love actual shells!! Made these last week. My husband and I went completely vegan a few weeks ago and I have to tell you, this is absolutely DELICIOUS. My husband’s normal response to a dish, unless it’s one of his (old) favorites like tacos, pizza, etc. is “it’s ok”. This? “This is really good!!”. Couldn’t agree more – and I used the leftover cashew cream sauce on pizza the next night and OMG soo good! Thank you for making this transition so easy! Hi Mary! I love hearing that – thanks for sharing!! Always great to win over the husbands with delicious vegan food. This recipe looks so delicious, but my sister is allergic to all nuts (except coconut) and has a peanut allergy as well. Any suggestions for a cashew cream substitution? Hi DD, try replacing the cashews with raw sunflower seeds (or you could use regular ricotta cheese if you’re not vegan). I accidentally bought roasted unsalted cashews. Could I use those? Or I randomly do have raw sunflower seeds. Should I use those instead? Hi Alisa, it’s really really best with raw cashews. They’re necessary for the cashew cream to taste creamy but not overwhelmingly cashew-ey. Sunflower seeds could work – but the texture is more gritty and I haven’t tested the ratios specifically with this recipe. They often require more liquid to blend than cashews. This recipe looks delicious! The cashew cream looks great. Can’t wait to try this out! Excellent recipe! I made this for my lunches this week with a side of asparagus. Super easy and delicious! Can’t wait to try this, I am gluten and dairy sensitive, I am always looking for a substitute for ricotta cheese, what can I use instead of the Tofu and I am soy sensitive too! Chickpea tofu! I just discovered it! It’s like making polenta. Is this recipe freezable? 😁 Thanks! 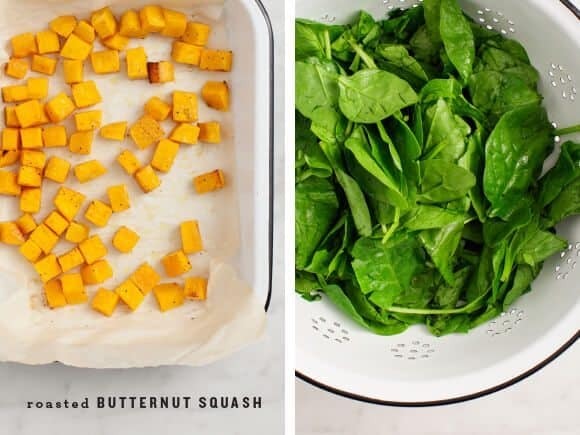 Could you use frozen butternut squash that is defrosted? Thanks ! Hi RJ – I’m glad you and your daughter enjoyed these – yes, I think covering might help, and maybe a drizzle of olive oil on the bottom in addition to the cashew cream. Thank you for your feedback, it’s so helpful! I made it for dinner yesterday and replaced cashew cream with feta cheese – amazing! Aside from the Squash, would you say the filling of cashews and herbs could be made ahead of time? Hi Amy – yep, you can make the cashew filling ahead of time! Do you think this can be made ahead/night before and then baked in the oven ? Hi Nicole, I haven’t tried so I can’t say for sure, but I think it would be fine. At the very least, the components could all be made in advance and assembled just before baking. Let me know if you give it a try! Made it for the first time tonight. So easy and yet soooooo delicious! These were great! The store was out of butternut squash so I subbed in acorn squash and it was still delicious 🙂 YAY vegan thanksgiving!! Absolutely delicious ! This recipe will be added to my rotation so yummy and filling. So glad you loved this one! New to vegan cooking. Am concerned these shells would be very dry on the outside after baking without any sauce……..I guess my question is, are they ? if so what would be the solution? Thank you. Your cookbook and website are both besutiful! Hi Sheila – they do get a little crisp on the outside. I personally don’t mind it but if you want to avoid it you can bake the dish covered with foil. Also note that the cook time here is only 15 minutes – since there’s not cheese to melt on top, you just want to cook until everything is warmed through. I serve these with the remaining sauce on top after they bake, but you could slather it on before baking if you like. (It just doesn’t bake like normal cream). Hope that helps! There are so many things I love about this recipe. All my favorite ingredients, pasta, butternut squash and cashews! I always try to eat lots of cashews for extra magnesium which stops me getting leg cramps. This is so delicious. I can see why it was a year favorite! This recipe looks amazing, but I’m allergic to Cashews. Do you recommend another sauce to place on top? made this much less vegan with spicy Italian sausage and full-fat ricotta. this blend of flavors was amazing and it really wasn’t difficult to make. my roommates were all really impressed. 10/10 would recommend!! Absolutely delicious, just finished eating it!! I made it for my family today without telling them it was vegan, and I only revealed it after they had all tasted it and told me how amazing it was!! I added a bit of paprika to the filing, and probably doubled the chili flakes for extra spice. I will 100% recommend this for anyone and everyone, vegan or not because it is just too good! Thank you for the great recipe that has instantly become a favourite! Any suggestion on what can be used instead of tofu? 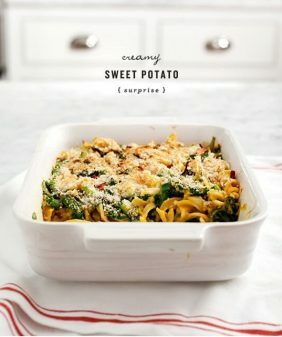 interesting swap for ricotta, will have to try it out and love the pasta “shells”, I forget to use them in dishes, so nice touch with all of the rest of these ingredients, thank you! Just wondering, could I use veggie broth instead of water in the cashew cream? WOW!!! I just made this recipe – unbelievable!! If I hadn’t made it myself I would have never guessed these were vegan. The filling is creamy and rich and the whole dish is filling and satisfying! I didn’t measure out the lemon juice for the cashew cream and just used the juice of 1 lemon, which I think was pretty close and it came out great. Thanks for another VERY yummy recipe Jeanine! 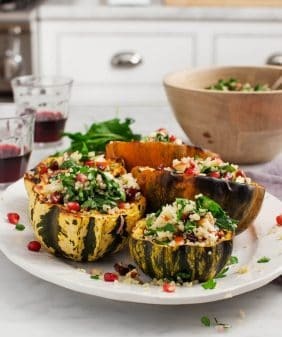 I have been so excited to try this recipe but cannot find jumbo shells anywhere! I live in Los Angeles and have been to two Whole Foods, one is the biggest Whole Foods location in LA! Super weird :/ because it seems pretty standard…anyone else have trouble finding jumbo shells? Or any tips where to buy? Hi Paige – I couldn’t find jumbo shells at Whole Foods (or any specialty stores) in Austin – I had to go to a regular grocery store and they were right there in the pasta section. Hope that helps! I made these for the fam last night, Jeanine, and they were fabulous. They tasted delicious and looked very fancy for something that didn’t require that much work. I’ll definitely be making it for company sometime soon. Thanks for the recipe! Hi Erin – I’m so glad these were a hit! Thank you so much for coming back to let me know!! Outstanding! I followed the recipe pretty much precisely and these turned out perfectly. I served this glorious dish to my boyfriend’s non-vegan family when I met them for the first time and they absolutely loved it. Thanks for helping me make a great first impression! Hi! I want to make these for thanksgiving. Can I make the filling the day before and bake the day of? Hi Erin – yep, you can! Happy Thanksgiving! This was wonderful! I subbed the cashews in the sauce with cottage cheese (less calories, more protein), and it turned out beautifully. This was my first time making stuffed shells, and it’s definitely one for the books. Made it and loved it 🙂 Thank you for sharing. Just stumbled onto this recipe. I am making cashew cream in a vitamix. It’s so watery, is it supposed to be that liquidy? Hi Peggy, it should be pretty thick – are you sure you drained the cashews before adding them? To thicken, at this point, I would add more cashews until it’s the consistency of alfredo sauce. As we let it sit, it thickened up quite a bit. I think my daughter may have added 5 or 6 more cashews. We didn’t soak the cashews because we were using a vitamix, therefore, we didn’t drain them. End result – We really enjoyed the recipe! It was really good with the butternut squash. We might put an Italian spin next time with marinara sauce on bottom and drizzled on top with some fresh parsley. Thank you for your response! oh phew, perfect! I’m glad you enjoyed the recipe and that it all worked out 🙂 It is delicious with marinara as well! This was amazing! My husband and I aren’t vegan, just looking for healthier recipes. We aren’t big tofu fans, so we swapped it for roasted cauliflower. It added a small crunch and was so good!. We will definitely be making these again! Aren’t shells made with eggs? Hi Amy, I’ve bought various brands and haven’t seen eggs on the ingredient lists… of course always read the labels of your pasta before you buy it to be sure.